Caption: Havasupai Falls. 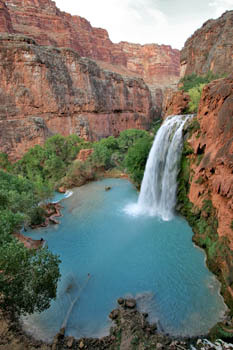 Namesake waterfall sets the tone for Havasupai Canyon, one of the 600 side canyons of the Grand Canyon. Comments: Havasupai Canyon is home to the Havasupai Native people who live in Supai Village. The canyon also has several beautiful waterfalls that draw thousands of visitors. But while the South Rim of the Grand Canyon gets nearly four million visitors a year and the North Rim gets 300,000, Havasupai Canyon draws barely 20,000.